simple and easy to make is this kathal ki sabzi made in a pressure cooker. the sabzi is flavorful and has a nice taste and meaty texture of the cooked kathal. 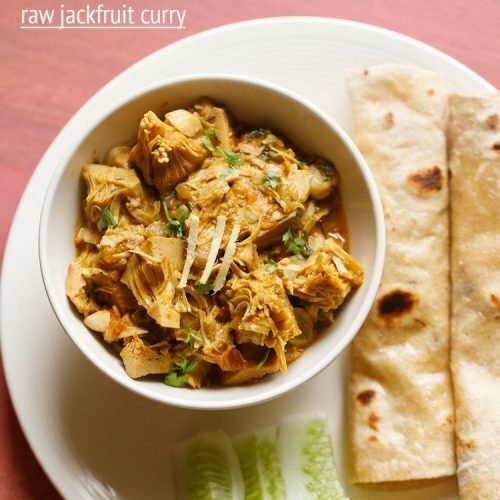 the recipe is made with kathal which is the hindi name for raw unripe jackfruit. spread some oil on your palms, knife and chopping board. rinse the peeled jackfruit. then chop the jackfruit. generally i get the peel removed from the vegetable vendor. in case the peel is not removed, then you will have to slice off the peels. if using chopped jackfruit already brought from outside, then rinse them in water first. soak the chopped jackfruit pieces in water, so that they do not get discoloured. you will need 3 cups chopped kathal. you can keep aside the jackfruit seeds and then make a sabji with them or add to sambar or veggie stir fries. if adding to stir fries the seeds have to be boiled or steamed before you add them. in a small blender or grinder jar, take ¼ cup coriander leaves, 2 tablespoons mint leaves, 1 teaspoon chopped ginger, 1 teaspoon chopped garlic and 1 to 2 green chilies (chopped). add 2 to 3 tablespoons water and grind to a smooth paste. heat 2 tablespoons oil in a 2 litre pressure cooker. add 1 teaspoon shahi jeera or cumin seeds, 1 inch cinnamon, 4 cloves, 3 green cardamoms, 1 star anise and 4 to 5 black peppers. let the spices splutter and become aromatic. mix the onions with the spices and sauté on a medium flame stirring often. sauté onions till they turn golden. then add the ground green masala paste. mix very well and sauté for 2 to 3 minutes till you see some specks of oil at the sides or on top. now add ⅓ cup chopped tomatoes. mix well. add ¼ teaspoon turmeric powder, ¼ teaspoon garam masala powder, ½ teaspoon kashmiri red chilly powder and 1 teaspoon coriander powder. mix again and begin to sauté tomatoes on a low to medium flame. stir often. meanwhile in a bowl beat ¼ cup fresh curd (dahi or yogurt). the curd should be fresh and not sour. sauté the masala till the tomatoes soften and become pulpy. if the masala mixture starts sticking to bottom of the cooker, then sprinkle some water and continue to sauté. now switch off the flame and add the beaten curd. as soon as you add curd, quickly stir to incorporate the curd in the rest of the masala. then keep the flame to a low and sauté the masala stirring non-stop. sauté till you see oil specks on the top and sides of the masala. then add the 3 cup chopped kathal (unripe raw jackfruit). add ½ cup water. if you use a large cooker, then you will need to add more water. season with salt as per taste and stir. pressure cook kathal ki sabji for 3 to 4 whistles on medium flame. when the pressure falls on its own in the cooker, remove the lid. if there is more water in the kathal sabji, then you can cook without lid on a medium-low flame till some of the water evaporates. crush ½ teaspoon kasuri methi and add to the kathal ki sabji. lastly add 1 to 2 tablespoons chopped coriander leaves. mix well. serve kathal ki sabji with chapatis or phulkas.